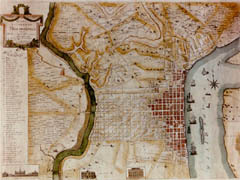 click image for close-up This map shows Philadelphia as it appeared around 1796. By then the commercial core of the city, stretching along the Delaware River from Spruce to Vine streets, had become a white area. Black families began to cluster along the cities northern and southern perimeters.